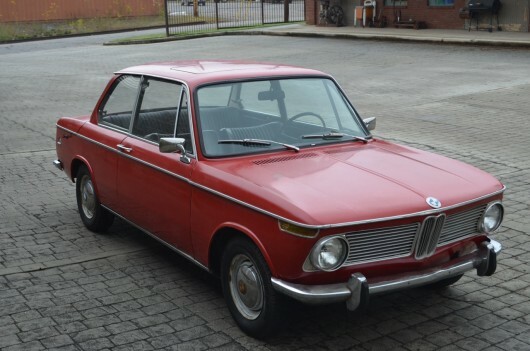 Found here on eBay is this very original BMW 1600. This 1968 Granada Red BMW 1600 was owned by one family from new until I purchased it in 2012. The original owner’s mother bought the car from Hoffman Imports on April 23rd, 1968. The car then lived a healthy life in Connecticut until it was moved to Colombia, South Carolina in the late 70’s. Stacks of receipts and records track nearly every service and oil change over the last 47 years. 1968 was the second year of production for what was known in Europe as the 1602. There are several parts and details on these early cars that changed from ’69 on. The smooth Euro front indicators remain and there are no side reflectors. The silver belt trim features textured wide oval sections that disappeared on newer cars and the lower black rubber trim is absent. The famous kidney grille and headlight grilles are all aluminum compared to the newer black plastic units. The Roundie taillights feature red turn signals compared to the amber versions that followed. Inside are factory low-back front bucket seats and a set of non-retractable seatbelts. The instrument cluster houses a factory clock in place of the tachometer that most 2002’s and newer cars had. Underneath is a rare long nose differential, early master cylinder with remote brake booster and a complete set of five steel wheels date coded 12/67. The early hubcaps are present complete with the rare separate beauty rings. Keen eyed 02 enthusiasts will notice the smaller 6-fuse box compared to the 12 fuse version that followed. Although many of the ’67 1600’s had 6-volt power this car is one of the first to swap over to 12-volt. The 1600 is in very original condition. In the late 90’s the original 1.6l powerplant was swapped for a rebuilt 2.0l from a ’74 2002. The only other changes the owner made over the years were the installation of a FIAMM air horn (yes, it sounds like a Ferrari) and a Pioneer tape deck in place of the original Blaupunkt am/fm unit. A Weber 32/36 DGEV Carburetor has been installed but the original SU and airfilter will accompany the sale. Most recently a larger radiator and electric cooling fan from an e30 were installed to help things stay cool. The original radiator and fan will also be included. The 1600 runs, drives and stops. Mechanical tasks on the horizon will be new motor mounts and exhaust hangers. The common rust spot on these cars are the rear shock towers and the trunk floor. These are in fantastic shape with no rust at all. The trunk and engine bay show no sign of an accident and are very straight. The floorboards are also in good shape. As this is a sunroof car it is pretty common for the drainage channels to rust the rockers below the door hinge. This car does have rust in the rockers that will need to be addressed and there is also rust in front of the pedal box. This is a great opportunity to grab an early ’02. 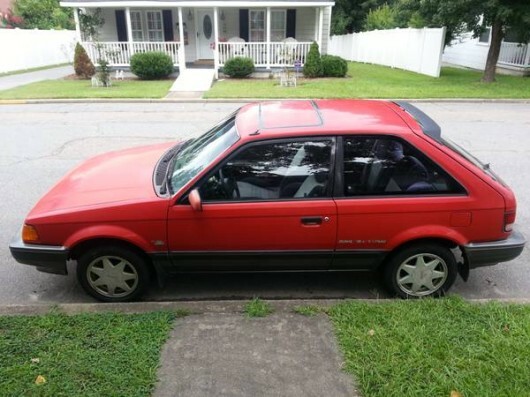 Values are on the rise and this 1600 would be a great car to make a daily driver or a good candidate for a full restoration. The car is in Athens, GA. Feel free to email with questions or to arrange a time to come and see it.